Home > Our Blogs > Facing Today > What is The One Word the Dictionary Should Add This Year? 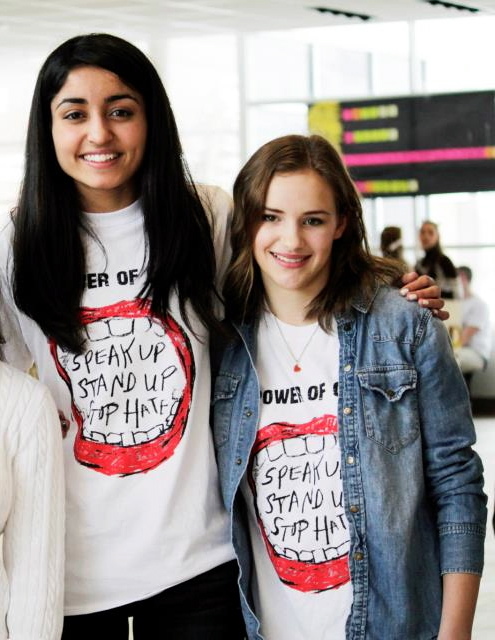 In high school, friends and Facing History students Monica Mahal (left) and Sarah Decker organized community events to raise awareness of bullying. Upstander is a term frequently used in Facing History resources and classrooms to describe people that take action on behalf of others – the opposite of the more commonly-used bystander (which is included in the dictionary). “We define it as a person who chooses to take positive action in the face of injustice in society or in situations where individuals need assistance,” Mahal says. So in January, Mahal and Decker created a Change.org petition that invites people to support the movement and add their name to a letter addressed to the Oxford English Dictionary. To date, nearly 400 people – from countries including Germany, China, Canada, and states from California to Connecticut – have signed on. “It makes me really happy to see that this idea of standing up for what’s right, it’s so simple it resonates with people from different cultures and countries, who speak different languages,” Mahal says. “It never struck us that it wasn’t a common word,” Mahal agrees. Both girls served on their high school’s diversity council and in their senior year, organized a community “White-Out to Erase Bullying” event, which raised awareness of bullying, of upstander behavior, and encouraged students to pledge not to be silent in the face of bullying at their own schools. Even the town’s mayor and city council members joined in. How does language shape our identity and our understanding of the world? 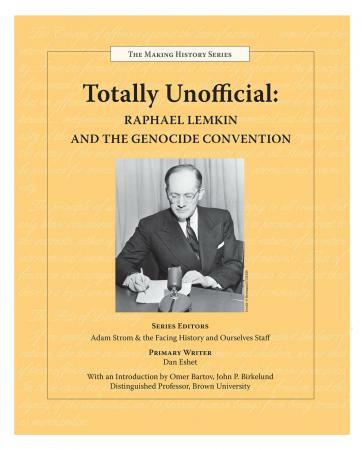 Check out the Facing History resource Totally Unofficial: Raphael Lemkin and the Genocide Convention. Born in 1900, Raphael Lemkin devoted most of his life to a single goal: making the world understand and recognize a crime so horrific that there was not even a word for it. Lemkin took a step toward his goal in 1944 when he coined the word genocide – destruction of a nation or an ethnic group. He said he had created the word by combining the ancient Greek word genos (race, tribe) and the Latin cide (killing). In 1948, nearly three years after the concentration camps of World War II had been closed forever, the newly-formed United Nations used this new word in the Convention on the Prevention and Punishment of the Crime of Genocide, a treaty that was intended to prevent any future genocides. In 1950, Lemkin’s word made its first appearance in the Merriam-Webster company’s authoritative English dictionary. The intentional destruction of human groups was no longer a crime without a name. How can finding the right words help us understand new problems? What is the role of language in dealing with social ills? How do innovations in language educate those who use the language? [UPDATE] In December, 2014, New Jersey State Senator Thomas H. Kean, Jr. introduced Senate Resolution No. 105 that urges Merriam-Webster, Inc. and the Oxford University Press to add the word “upstander” to their dictionaries. Read more. Do you want to see the word “upstander” added to the OED? Take a minute and sign the petition.